LiveBest Popcorn is something delicious and different in every bite. 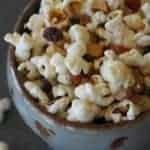 Almonds, coconut, walnuts, dried apricots, cayenne, and oh, yeah, popcorn! Place popped popcorn in a large bowl. Set aside. In a medium-sized pan, melt butter with oil over medium heat. Add walnuts and almonds, stir occasionally for 5 minutes. Add raisins and apricots, stirring occasionally for 3 minutes. Stir in coconut, cook 1 minute. Add sugar and cayenne pepper and stir until sugar dissolves, 1-2 minutes. Pour over popcorn. Sprinkle with salt. 1/2 cup popcorn kernels equals about 15 cups popped corn.